NEW CONTRACT: Easkey Post Office has been awarded a new contract. EASKEY Post Office has given a new contract. News came this Monday afternoon that a new contract has been awarded to Easkey post office to safeguard its future following threats of a possible closure. 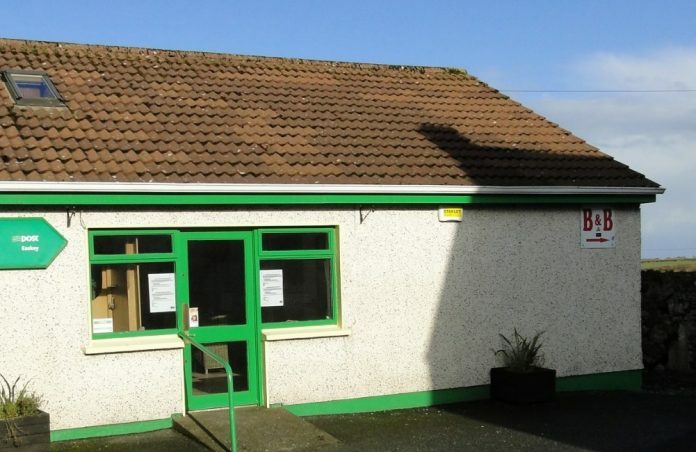 Sligo – Leitrim TD Tony McLoughlin gave the news on Monday and thanked the local people for their participation in the public consultation and said the retention of the post office will strengthen the community in Easkey over the coming years. “Following the news about the retirement at Easkey PO and the establishment of a local group, I contacted An Post to seek that that conduct a public consultation on the issue. I called for the contract to be re-advertised, going directly to An Post Management, Minister Naughten and Minister Ring to fight the case for the local community,” he said. There will be more reaction from this story in this week’s Sligo Weekender- out Thursday.